Some liken changing a place to turning around a tanker; slow progress before you’re going in the right direction. Well, that’s true but before you venture into new seas you should make the necessary checks to make sure the ship is fit for the journey. And that’s the link to this week’s blog theme – Oldham Council as a cooperative council. Before we set out trying to change the relationship between the community and public services we have to work hard to get our own house in order. I believe we’ve made progress towards that aim by modernising local democracy. Oldham council is more accessible and open than before with more residents engaging, raising questions, and becoming involved than ever before. We’re making good progress in making sure the council operates in an ethical way through constitutional changes, new values and behaviours for staff and residents as well as some fundamental changes to the way the council spends public money with Social Value Procurement already beginning to pay dividends for the community. But for the council to be open to the community it has to be more than a transactional relationship – even doing things in a way that is fair and ethical won’t be enough. Perhaps due to the topography, or political decisions which went against local opinion, there is a feeling that the council’s buildings are ‘Oldham’s Ivory Tower’ and this has to change. We’ve invited the community into council meetings through webstreaming but until recently if a community group wanted to use a council building for a meeting the cost could be as high as £300 for a modest room. This is an instant barrier if we want to be part of the community and goes against the idea of supporting people to ‘do their bit’, as it could seem that when they did we cashed in. Don’t get me wrong, I fully see the rationale to charge for room hire, but incrementally the cost has got so high community groups are simply priced out of the market. 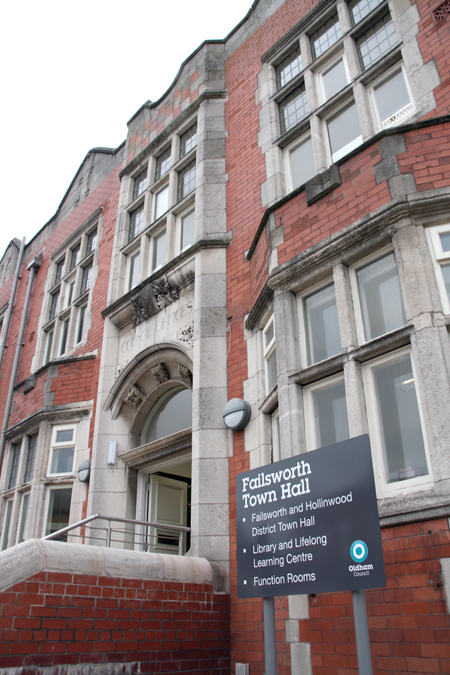 We have approved a wide ranging Cooperative Asset Policy which promotes the use of public buildings to support our ambition for a vibrant Cooperative Borough where everyone does their bit, and then share in the dividend of that. The policy puts an end to not-for-profit groups being priced out with excessive hire charges, while ensuring commercial events such as weddings remain at a commercial rate. The policy goes even further than just room hire. We are promoting long leaseholds, asset transfer and more community involvement in running local facilities currently run by the council. For example, we have streamlined the process for considering asset transfer and the promotion of the community right to bid. So call it an Ivory Tower if you wish. But instead of saying its ‘where the council is’ perhaps, if this policy works, people will begin to say its ‘where the community meets’, or am I being a little too optimistic? 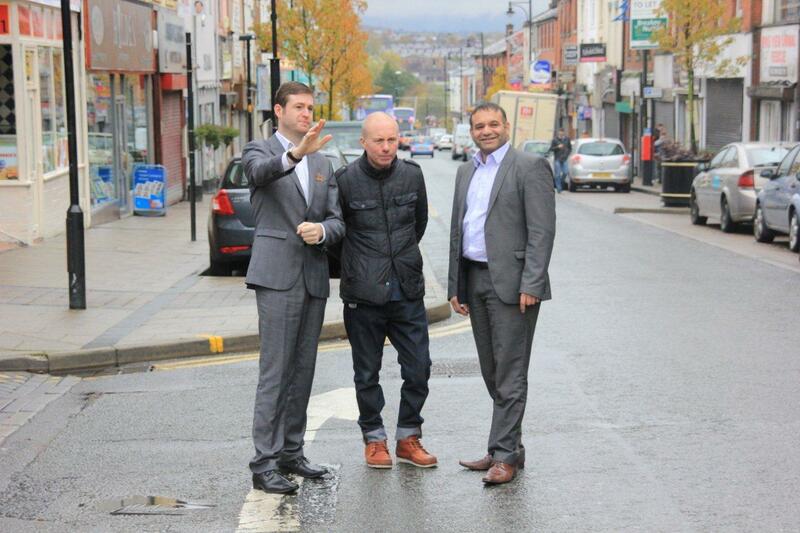 TRADING IDEAS: Jim McMahon discussing the plans to help independent town centre traders with Paul Hughes, from Zutti Co, and Councillor Shoab Akhtar on Yorkshire Street this week. INVESTING in large-scale developments which provide anchor tenants is an important part of our plans to regenerate Oldham town centre – but it’s not the whole picture. These schemes are already moving forward as the opening of Metrolink draws near early in 2014. Work has begun on the flagship Old Town Hall cinema and restaurant venue, for example, and matters are also progressing for a new modern office HQ for First Choice Homes Oldham on Union Street. We have been clear all along that regeneration isn’t just about ‘big ticket’ projects and attracting large national retailers – even though the recent arrivals of BHS, Toymaster and Blue Inc have given a welcome boost to footfall in the shopping centre. 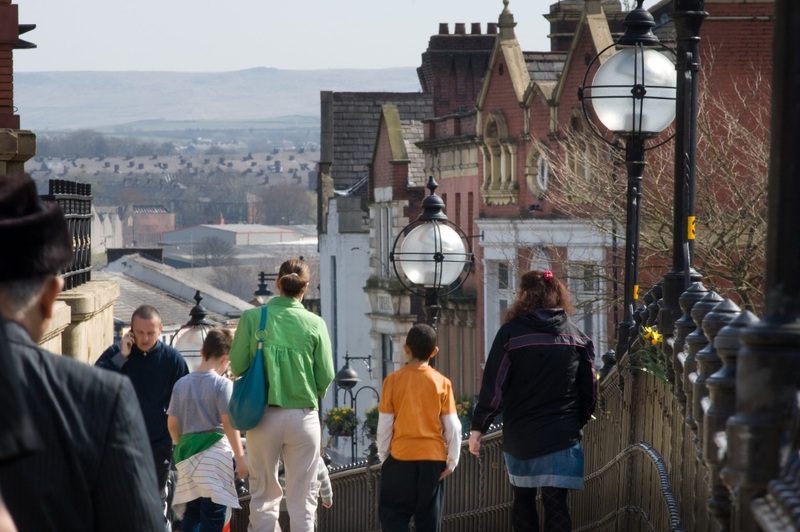 For Oldham town centre to have a brighter and sustainable future we also have to create an environment where the residents of the Borough feel better connected to it. The introduction of free weekend parking for up to three hours and free on street parking was part of this and wasn’t, of course, free of cost to Oldham Council. The loss of revenue to the coffers is around £600,000 a year, but we know it has increased footfall by around 30 per cent bringing in more than £1.5m in trade to Oldham’s shops and town centre businesses. It’s a hit we believe is worth taking. Even though we are in a difficult financial position we have been conscious that we must focus on the ‘fightback’ as we work to create the Oldham we demand. It meant not taking short-term cash out at the cost of the viability of the town and – at the very least – the free parking will remain in place until the major regeneration schemes are complete and the pain of Metrolink construction is over. Our investment in events and activity in the town centre has also been central to bringing in more visitors. Although I’m no Sci-Fi enthusiast it was clear the recent Doctor Who events were a big success – attracting around 6,000 people. 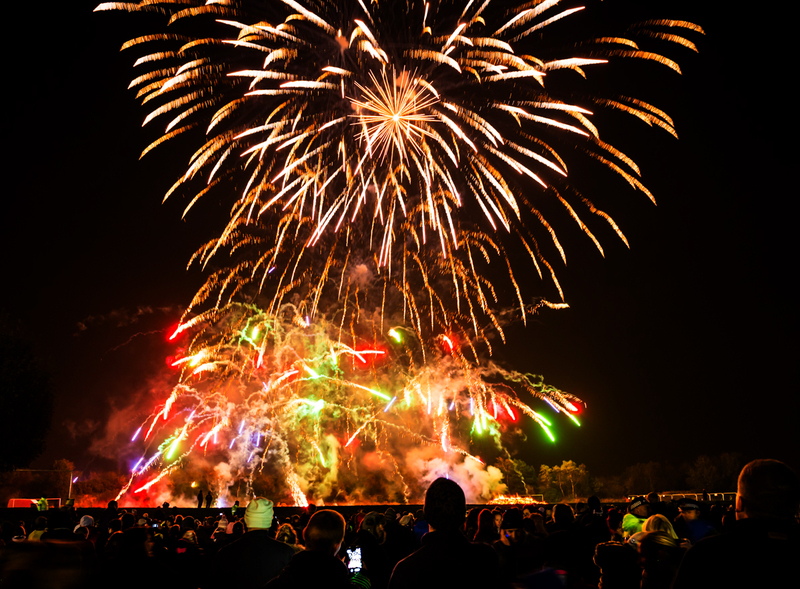 The same can also be said of The Big Bang bonfire, with pulled in more than 15,000 visitors, and last weekend’s Christmas Lights switch on where Bob The Builder attracted over 10,000 people. These kind of events, coupled with investment in markets, give people a reason to visit and they complement the work of the Spindles Town Square shopping centre and other businesses involved in the Town Centre Business Partnership. This week’s launch of a new £1m investment fund (see here) to boost independent businesses – approved by Cabinet on Monday – is also going to provide another major boost. We are to invest in new and existing independent businesses to initially revitalise the ‘triangle’ area between Yorkshire Street, Clegg Street and Union Street (East) to create a High Street environment that provides a very different offer. This fund will also be used to undo some of the more inappropriate alternations to buildings in the area as we consider removing Permitted Development Rights with an Article 4 Directive. Roller shutters, poor signage and general insensitive development have detracted from the genuine beauty of some of the buildings in and around the area. You only have to look up beyond the ground floor to appreciate that we actually have some great buildings here which, with a small investment, will create a focal point we can all be proud of. With the imminent arrival of Metrolink it is clear that more investors are now seeing Oldham as a place to do business. A walk on Yorkshire Street this week to discuss our plans with Paul Hughes from Zutti Co demonstrated the confidence that is starting to be felt in that part of town. We heard about a new café and hairdressers that are being fitted out ready for opening in the next couple of weeks. The decline of the eastern part of town started well before my time – actually before I was born, I would say(!) – and well before internet retailing became a threat to the High Street. Perhaps it was a result of the sheer size of the town centre or poorly coordinated development but, whatever the reasons, I believe the building blocks are being placed today which will begin the fightback. This isn’t going to be easy, it isn’t going to be quick and – be under no illusions – it isn’t cheap. But the only alternative is that we stand by and simply manage decline. That’s not good enough for Oldham anymore. If we want the town centre we all demand with the facilities it needs to carve a prosperous future then we cannot sit here hoping someone will come along and do it for us. We have to lead from the front. If you put this support for independent traders alongside the newly established £1m Enterprise Fund you can see there is now more assistance than ever available to new business start-ups: all there to invest in people who, in turn, will invest something of themselves into Oldham. So the message is going out loud and clear: Whether you’re an existing trader, landlord or someone looking to start out – Oldham is open for business. ECONOMY: For any town centre to succeed it needs a vibrant night time economy just as much as a daytime offer. IT WAS the annual Best Bar None awards last week – where leading bars, pubs and nightclubs come together to promote a healthy night time economy and celebrate success. It is fair to say that the night-time economy of Oldham town centre is now a shadow of its former self but, unfortunately for licencees, quite a lot of people in the Borough are actually quite relieved about that(!). Several years ago that area, particularly around Yorkshire Street, was burgeoning and regularly packed out with punters. But with any success story you inevitably find that some fly-by-night operators will come along and jump on the bandwagon in a hope to simply cash in and we saw that with some of the types of bars and takeaways which sprang up. There were cheap promotions with drinks often for £1 or less, meaning that bottled water was actually more expensive to drink than vodka. This, sadly, encouraged people to drink as much as they could – and often more than they could handle – before being carried out and ending up in a gutter or worse: fighting in the streets. Don’t get me wrong here – I fully appreciate the problems facing the pub and bar trade. Supermarket deals significantly undercut any town centre establishment and fuelled a problem whereby many revellers were ‘pre-loading’ on cheap booze at home before they’d even arrived in town to dance the night away. Those deals remain unchallenged. For any town centre to succeed it needs a vibrant night time economy just as much as a daytime offer. But equally the town centre is for also everyone – not just for ‘kids’ (you can tell the Council is aging me quickly!) or for those slightly older who still behave like kids. I had the recent pleasure, well perhaps the ‘experience’ at least, of being on Yorkshire Street in the early hours of Saturday morning with my partner after a meal and drinks with friends. Although Oldham is not alone in this – and maybe I’m just getting too old and grumpy – but it didn’t feel as though we have moved on much from the modern disease of going out to get drunk rather than for going for a drink, and the effects are very different. As we plan for the new Oldham we are building we have got to make a decision about how much the current night time economy fits with our vision for a vibrant, healthy town centre. Even today, despite the reported demise of the night time economy, visitors to Oldham Coliseum regularly report feeling unnerved at some of the goings on as they leave the theatre late into the evening. That’s why I welcome the words of Terry Bruce, the owner of Liquid and Envy, in throwing down the gauntlet to the industry to ‘raise the bar’ at the Best Bar None awards. He believes town centre bars need to offer people more and voiced some promising ideas, including the creation of a venue designed to attract people of all ages. For any night time economy to work it has to self-regulate better than it previously did. The Council, Greater Manchester Police and volunteers like the Street Angels can all help but we have limited power against cultural issues or the very apparent ‘race to the bottom’ which sees venues trying to offer the cheapest deal, rather than the best night out. With the cinema on its way to the Old Town Hall supported by a great selection for national and local brand restaurants, Oldham-based bar operators do have a real opportunity to help change our night-time economy for the better. Soon we will also firm up plans for the new Coliseum Theatre and Heritage Centre on Union Street which will bring in visitors from further afield. And all that would be in vain if we allowed Yorkshire Street and the surrounding area to descend unchecked again. We need to sit down with the bars and nightclubs and talk about how the two economies can live and thrive together. For some they are part of that vision, for others it could be a much shorter conversation. In our bid to create the town centre boom we need to make sure those trying to make a quick buck don’t descend on Oldham and undermine what we’re trying to achieve here. Put simply, we need to aim for quality, not quantity. THE BIG BANG: Oldham Edge played the perfect host on a night that entertained thousands of families. THE SECOND annual Civic Bonfire – The Big Bang – served up a spectacular display on Tuesday night. I must admit that downpouring rain and high winds in the days before Bonfire Night was giving us major cause for concern but, thankfully, it was as if someone was looking down on Oldham that evening as the rain finally broke up and the winds becalmed. It was a particularly unnerving time as the staging arrived and the fairground began setting up to find yourself constantly checking weather forecasts but, as it turned out, the event was never in doubt. Either that or it was a fluke of the weather system – but whatever it was we were very relieved! My role in this event was easy: find the money in the Council coffers to enable it to happen and then turn up and enjoy the show. Others people’s roles were to actually make it all happen and the sheer amount of planning and hard work involved in setting up, promoting and then running a successful big event like this cannot be underestimated. What stood out for me – aside from the unusual sight of in excess of 15,000 people gathering on Oldham Edge – was the fabulous family atmosphere and community spirit on show. The beauty of picking the Oldham Edge site also lay in the sheer height of the location, which towers above the town centre. This meant that, in addition to those who were at the event itself, many thousands more could watch from the comfort of their own gardens, streets and places of work with many inspiring photos sent through to us from all corners on Social Media. As a Borough we have a number of events throughout the year that we can be proud of. Most notably these include the Oldham Carnival and the Christmas Lights Switch On, but there is a whole host of other big events like the Saddleworth Band Contest and the Oldham Beer Festival, plus many hundreds of other local community activities. My point is that these events define our Borough: thousands of people working together to create the fabric of our place. When we say we’re working towards being a Cooperative Borough here is the living proof that we are building on the strongest possible foundations. When I became Leader I was determined to make Oldham Council more relevant to the people it serves – and bringing back the Civic Bonfire last year was a key part of that. I know that some people may question if it is a good use of money – and they have every right to do so. But my firm view is that at £2 a visitor the event is excellent value for public money and – as a partner in a Cooperative Borough – our role is to step up when needed to do the things that individuals or community groups cannot be expected to deliver by themselves. A major event like this with all the risk management and safety planning needed required the Council to step up and do its bit; and it did. This was a great partnership effort all round. First Choice Homes Oldham, for example, sponsored it and worked hard to keep all their tenants informed of the plans, as well as providing volunteers. 96.2FM The Revolution provided a vital meeting space for the night, worked hard to swell the crowd and also gave us our fantastic compere – Big Al – for proceedings. Fantastic Fireworks also did exactly what they promise – and New Image did a great job with our temporary stage and lighting. Oldham Council staff also did their bit. There were too many contributions to mention here but Glenn Dale and his Environmental Services team did incredible work to build a safe site from scratch inside 24 hours – and then clean it up again. It was especially heartening to see such a large number of volunteers (guided by Vicki Gallagher) helping out and, of course, we can’t forget all those local residents and businesses who put up with the ‘invasion’ with barely a gripe. So, on Tuesday night felt proud of Oldham – and proud of Oldham Council. And more importantly I was only one of thousands who felt that. Staying with the ‘feel-good factor’ theme I also have to mention the Oldham Chronicle’s ‘Pride in Oldham Awards’ last Friday night. Again this did what it does best: recognise the unsung heroes across our Borough who go above and beyond to create the place we have today. To see so many people acknowledged was special because – without exception – none of those in the room sought attention or praise. They do what they do because they recognise that by doing their bit they get a dividend back; a feeling of something bigger than themselves. And it’s also fantastic that we have a local newspaper which does not allow their efforts to go unnoticed. *Note for readers outside the Borough: this is the height of praise.